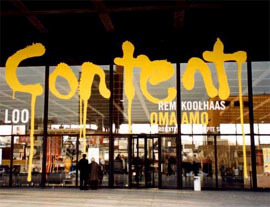 In case it’s slipped your notice: the OMA-AMO exhibition ‘Content’ opens tomorrow in the Kunsthal in Rotterdam. ArchiNed brings you its own ‘content’ on this exhibition. Rem's junk in Mies' space (20-11-2003) – about the Content exhibition in the Neue Nationalgalerie in Berlin. Glossy with Content (10-2-2004) – about Content the book. Modest Koolhaas in Berlin (17-11-2003) – about the new Dutch Embassy in Berlin. Do you want to know more about Koolhaas/OMA/AMO?